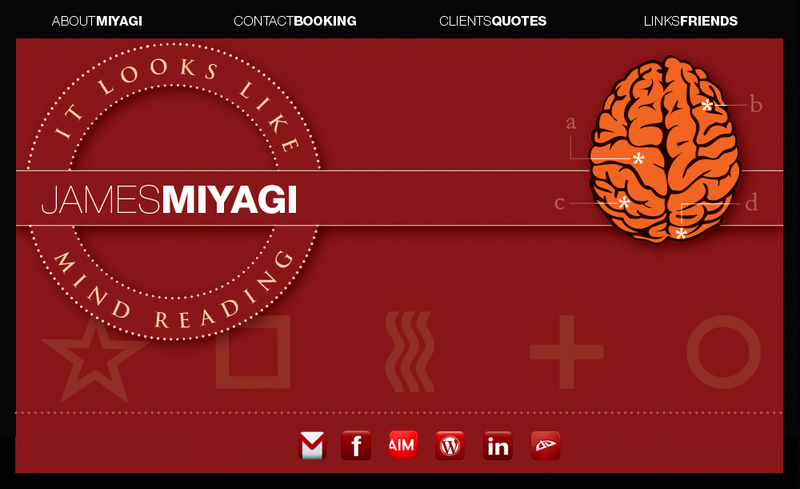 James Miyagi, over the course of his life, has developed a very unique and specialized set of information-gathering skills -- some innate and some acquired -- consisting primarily of ascertaining personality traits on the basis of analytical and targeted observation of personal effects, unconscious physiological communication and the spaces people occupy. Miyagi's unhealthy obsession with human personality traits, behavior, and thinking patterns has resulted in a penchant for quickly sizing people up (what Malcolm Gladwell calls "thin-slicing") and manipulating behavior through subtle uses of verbal as well as unspoken communication. One of his heroes, albeit fictional, is Sherlock Holmes --arguably the first and most well known criminal profiler of Western culture. Miyagi's insatiable fascination with the science of deduction and his enthusiasm for sharing it with others has led to the creation of an entertaining and mind-boggling stage performance that illustrates these seemingly supernatural skills. It looks like mind-reading.